Highlights include the Echo Dot for $24 and up to 40% off select coffee makers. 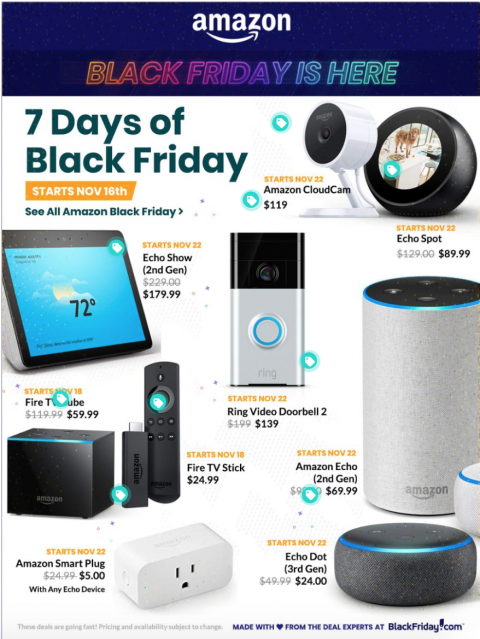 Amazon has announced its 2018 Black Friday Deals Week, giving a preview of discounts across electronics, toys, fashion, kitchen and many more categories. Amazon devices are among the most prominent deals again this year. Customers can shop the sale online and in the app, plus browse new deals of the day each day. Toshiba 50-inch 4K Ultra HD Smart TV – Fire TV edition for $299.99 (save $100). Save over 15% on select Samsung QLED TVs (now through Cyber Monday). Up to 40% off select toys from Barbie, Hot Wheels and more. Up to 40% off select Adidas apparel, bags, shoes and accessories. Up to 70% off select Samsonite luggage. Up to 40% off select coffee makers. As a bonus, shoppers can get $5 off select deals by using camera search features in the app, including the bar code scanner, or Amazon’s augmented reality feature. Prime members get extra perks — early access to discounts and exclusive deals when they shop using Amazon’s voice service, Alexa. You can find additional savings now, but read the sale details closely. Many “deal of the day” discounts are available for a limited time only. In 2017, Amazon rolled out deals throughout Black Friday week. Amazon’s own products were some of the most notable bargains. Kindle Paperwhite for $89.99 ($30 off). Fire HD 8 tablet for $49.99 ($30 off). Echo Dot for $29.99 ($20 off). 49-inch 4K TV for $159.99. Up to 30% off select Crayola arts and crafts. Up to $100 off select PlayStation virtual reality bundles. Up to 60% off New Balance shoes and apparel.